More than half of US workers would prefer a root canal than to work during vacation, but they cave in to bosses' demands by using mobile technology on their down time, a new Harris poll showed. 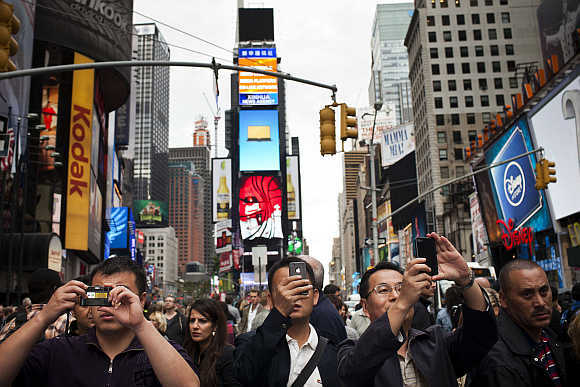 Image: People take photos in Times Square in New York City. Mobile devices let people stay connected with work 24/7, which is both "revolutionary and a curse," said Terrie Campbell, vice-president, strategic marketing at the global technology company Ricoh Americas Corp, which commissioned the poll. 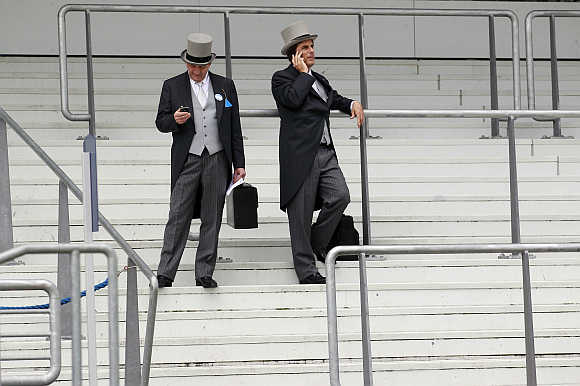 Image: Two racegoers talk on their mobile phones on the fourth day of racing at Royal Ascot in southern England. Nearly three out of four Americans admitted they would be angry if they lost their smartphone on vacation because they wouldn't be able to check in at work, the online survey showed. 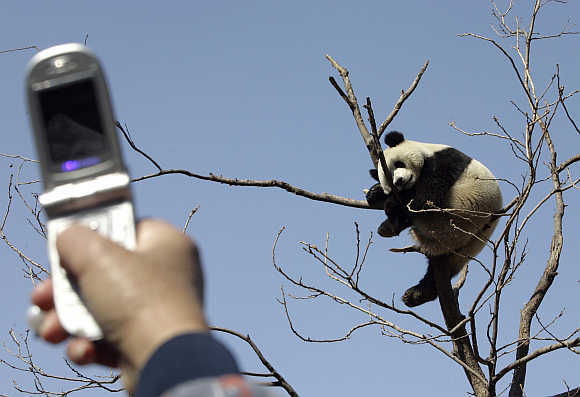 Image: A visitor uses a mobile phone to take a photo of a giant panda sleeping in a tree in Beijing Zoo. "At some point, employees need permission to turn off the work email, relax and re-charge while they're on vacation," Campbell said. "If they can't leave the office behind, what's the point of vacation?" 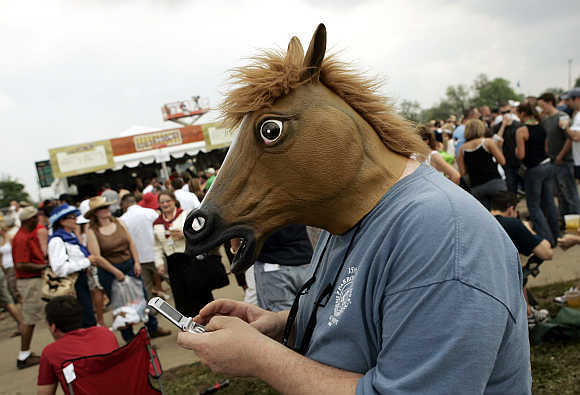 Image: A spectator, wearing a mask in the shape of a horse's head, uses his mobile phone before the running of the Kentucky Derby at Churchill Downs in Louisville, Kentucky, United States. The poll of 2,071 US adults showed that Americans struggle to take real time off from work, with 30 per cent using their smartphone for work-related purposes while relaxing at their favourite vacation spot. 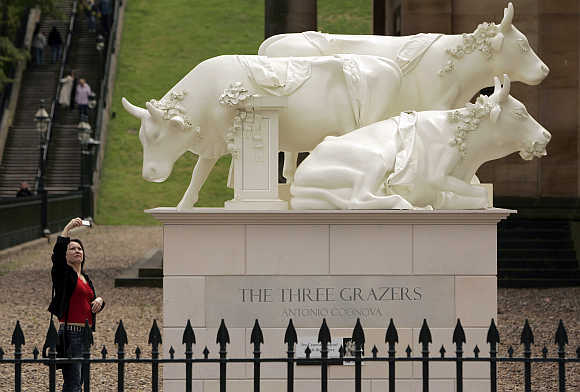 Image: A tourist take a picture on her mobile phone of a sculpture titled The Three Grazies, part of the Cow Parade art show on display in Edinburgh, Scotland. About 51 per cent of US adults would rather have a root canal than work while on vacation, but 54 per cent said their bosses expected them to stay connected during their time away. About 67 per cent said family members get upset when a loved one works while on vacation. 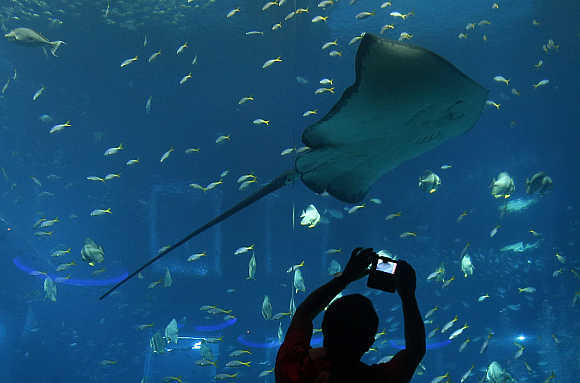 Image: A man takes pictures of a stingray in the Resorts World Sentosa's Aquarium in Singapore. Twenty-seven per cent also said they can access work files from a remote location and a similar number use their phone to keep in touch with clients and coworkers. 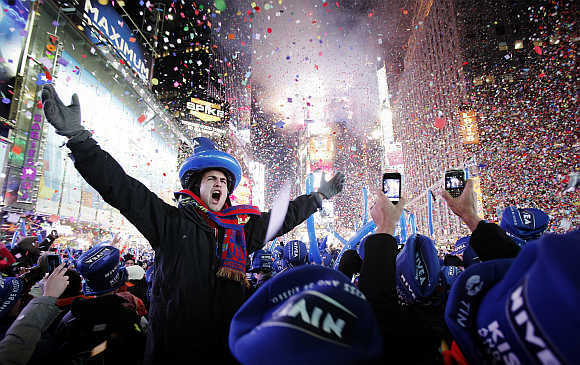 Image: Revellers celebrate the new year in Times Square in New York City. On a more positive note, more than six out of 10 people said checking emails while on holiday makes it easier to ease themselves back into work when the vacation is over. And a similar number of people thought mobile technology has made their work-life balance better, not worse. 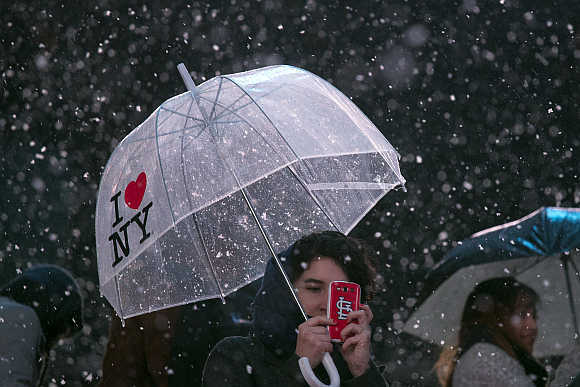 Image: Chelsea House of St Louis takes pictures in Times Square as snow falls in New York City. IMAGES: Brilliant tech innovations you must see!